It is a sad fact that on the whole old buildings were not greatly valued in Karoo towns, and Calvinia was no exception. In the midst of this deplorable situation an opportunity was born and recognised. Since moving to Calvinia from Pretoria, Dr. Erwin and Ms. Alta Coetzee bought, repaired, renovated and restored a number of properties and old buildings. By virtue of their restoration and conservation work they have created jobs and made the local community aware of the value of old buildings and how to use them effectively to generate income. 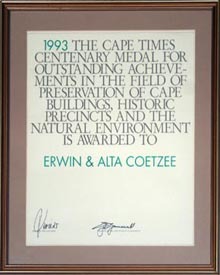 Dr. and Ms. Coetzee richly deserve the Cape Times Centenary Award they received in 1993 for their continuous conservation efforts. Calvinia’s tourism industry received a major boost when the Coetzees decided to step into the arena with their wonderfully innovative ideas. Situated in Calvinia are some very, very special places called Hantam Huis, Dorphuis, Hantam Herberg, Die Lodge, Ligthart, Stigling Straat 38 and Tuishuis respectively. 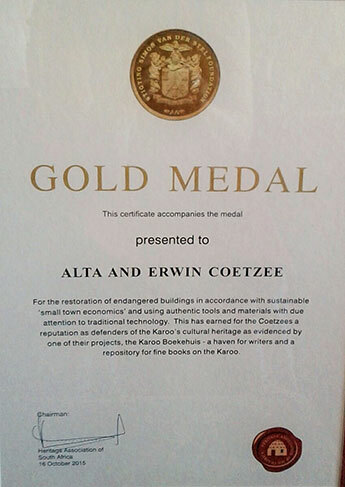 The Coetzees own and operate these exceptional examples of restoration. Besides the fact that these two wonderful people really understand the art of hosting, they, like Calvinia, quickly become such a part of your life that it is almost impossible to leave when the time comes. You will experience that saying goodbye to these people is extremely difficult to say the very least.